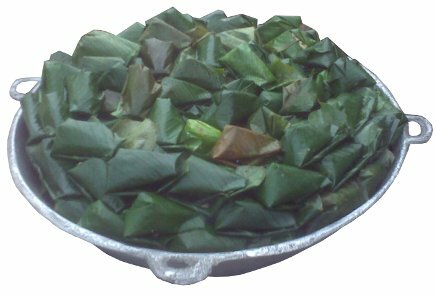 Uma (Thaumatococcus Daniellii) leaf is the Moi Moi wrapper you should go for at all times. If you want your Moi Moi to cook even faster, this is the wrapper for you! It is 100% natural and even adds some flavour to the Moi Moi. Remove the leaf stalks. Don't just cut the stalk off, there's a special way to remove it so that some of the stalk at the back of the leaves are removed too. Watch the video below to see that. Wash the leaves meticulously. It is advisable to wash them at least 2 times in lots of water. The first wash is with salt water and a foam sponge. This ensures that all the dust and dirt are removed. The second wash is basically rinsing them in plenty of water. Also wash the leaf stalks, they will be used as padding for the base of the pot. Mix the Nigerian Moi Moi. Use the stalks of uma leaves that were taken out from the leaves to pad the base of the pot. These prevent burning of the wraps at the base of the pot. Pour a small quantity of water into the pot and bring to a boil. The quantity of water should be so small that your fingers will barely touch it. 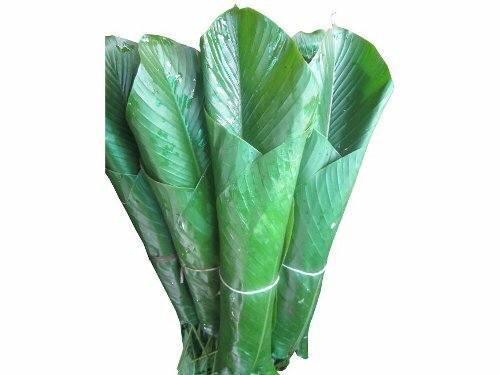 To make uma wraps: First of all, place 2 leaves on top of each other, fold them into a cone. Then bend the pointed end and hold it there. Put some moi moi mix into the cone. Fold the open end and place the wrap in the pot of boiling water. It is advisable to use at least 2 leaves to make one wrap. This doubling ensures a better reinforcement for the moi moi wraps to avoid leakages. Please note that with uma leaves, it is hard to achieve 0% leakage but we can live with tiny leakages. If you do not get it the first time, do not worry. This skill is perfected with practice. With time, you may even device your own easier method of doing this. Just remember that the goal is to make a wrap that allows the moi moi stay in the leaf without leaking out. There is no one formula of doing this, neither is it magic! Watch the video below to see how I do it.